Mirror, Mirror on the wall—which Queen has the most jewels of ALL?Royal Queens have collected some of the most rare and precious diamonds, gemstones and pearls throughout history. The book “Queens Jewels” by Vincent Meylan, traces some of the royal jewels owned by several queens. Each story is as unique as the queens themselves—you be the judge as to who acquired the ‘best’ and ‘most’. The Russian Crown JewelsLinked between the east and west, Russia was a crossroads for the trading routes. The south and east was a major source for turquoise, pearls and diamonds that were purchased from the Dutch and French traders. Tsarinas Elizabeth Petrovna and Catherine the Great accumulated and amassed an impressive collection—especially diamonds.It was discovered in the nineteenth century that the Siberian mines were filled with diamonds, alexandrites, sapphires, amethysts, aquamarines, garnets and tsavorites. With increasingly extravagant lifestyles, the wealthy Russians started manufacturing their own high jewels comminissioning artisans like Faberge, Boucheron and jewelers of the imperial court. During that period, a diamond necklace, now in the Russian state treasury, was created with twenty one round diamonds, the largest weighing thirty two carats and fifteen pear-shaped diamonds, the largest one twenty five carats, was estimated in 1909 at 498,000 rubles—$17,911.00.Empress Alexandra Feodorovna, the last Tsarina of Russia, had a collection of the most extraordinary jewels that were considered to be the most incredible in all of Europe. What happened to the jewels? They simply disappeared. As the story goes—in April 1918, the Empress trusted the nuns to hide her jewelry, diamond tiaras, a brooch set with more than a hundred diamonds, diamond clasps with pearls and many more –one hundred and fifty-four jewels total. Four months later the nuns learned that Emperor Nicholas II, Alexandra Feodorovna and their five children had been executed. Concerned that the Bolsheviks would search the convent, the nuns delivered the royal jewelry to an old fisherman who had remained loyal to the Romonavs. Buried beneath his wooden floor for fifteen years, the treasures were not found until a relative contacted the political police in 1933. 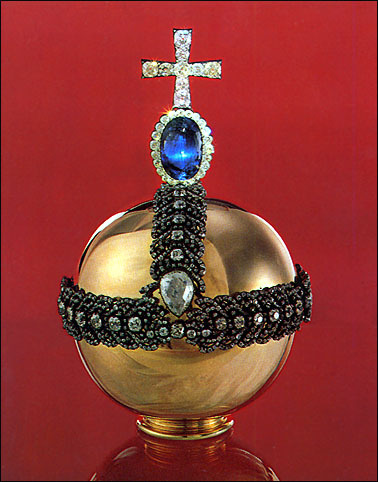 Armed with pickaxes and shovels the police unearthed sealed jars packed with jewelry –and according to the KGB report in 1933, the jewels were valued at eight million dollars.The crown jewels worn by the Romanovs were property of the state and were transferred to the Kremlin in Moscow for safekeeping. A published detailed inventory in 1926 stated that the collection contained twenty five thousand and three hundred carats of diamonds, (eleven pounds). Also included were four thousand and three hundred carats of rubies, many carats of emeralds and several thousand pearls. Some of the jewels are in the Kremlin’s Armory Museum in Moscow, however, the majority of the collection was dismantled and sold to foreign private collectors. The ‘jewels in the casket’ were then transported by the Queen’s hairdresser to Brussels and then on to Vienna to her nephew, the Emperor of Austria for safekeeping. Marie-Antoinette’s only surviving child, Madame Royale, was freed and found refuge in Austria with her mother’s family. She was then given her mother’s jewelry. Her cousin, the Emperor, demanded the jewels as payment for her living expenses. Therefore, Marie-Antoinette’s jewels became part of the Hapsburg Jewels and they disappeared a century later when a businessman who befriended the family stole the Hapsburg’s entire jewelry collection. The British Royal Crown JewelsThe crown jewels of Britain are known as one of the most extraordinary and valuable diamond and gem collections in the world today. Yet almost the entire collection was amassed in less than a century after Victoria became Queen in 1837.The Royal Jewel collection grew as the British prime ministers from the new colonies, stretching from India to South Africa, each gifted Queen Victoria with precious gems and jewels. The emerald parures were valued at four million dollars and the additional diamond, ruby and pearl jewelry was valued at five and a half million dollars.Duleep Singh, the Maharajah of India, traveled to England in 1849 after the last of his provinces were taken by the British, to present the Queen with a chest of his finest jewels– including the famed Koh-I-Noor or ‘Mountain of Light’ diamond weighing 280 carats. Recut by the Queen’s jewelers to 109 carats; the Koh-I-Noor was centered in her diadem. Queen Mary wore the diadem in 1911 and Queen Elizabeth in 1936.The largest diamond in the world weighing 3,106 carats (over 21 ounces), was discovered in South Africa in 1905, from a mine owned by Thomas Cullinan. With a price tag of five hundred thousand pounds, the British came up with a solution for purchasing the diamond for their crown. General Botha, Prime Minister of the Transvaal, suggested that the Transvaal Government purchase the diamond and offer it to King Edward VII as a symbol of its gratitude for granting independence to Transvaal by Great Britain.In 1980 the estimated value for the Cullinan diamonds (cut into five individual stones) were worth approximately twenty-seven and a half million dollars. The Sovereign’s Scepter contains the Cullinan I—the largest of the five diamonds.The jewelry collection amassed by Queen Elizabeth II included a large sapphire and diamond necklace and earrings, a ruby and diamond necklace with earrings, two strands of large fine pearls and large diamond pendant earrings, a diamond diadem, corsage brooch, two diamond bracelets, a ruby bracelet and a pair of pearl and diamond earrings.In 1949, Princess Elizabeth was given a deep pink brilliant diamond weighing 23.60 carats with a clarity that had not been seen before, it was set by Cartier as the center of a diamond flower brooch. Her collection increased when she took the throne in 1952. To commemorate her coronation, the government of Burma presented her with large ruby necklaces. King Faisal and King Khaled each gave her large diamond necklaces, the Emir of Qatar gave her a large sapphire and diamond parure and the Emir of Bahrain gave her a pearl and diamond necklace. While visiting Brazil, Elizabeth II collected large aquamarine jewelry. Her personal jewelry collection was estimated, in the 1980’s, to be over forty-five million dollars. There are nine crowns locked inside the Tower of London and the most incredible is the Imperial State Crown. Made for the coronation of Queen Victoria in 1838, the Cullinan II diamond was set in the central band with the ‘Black Prince’s Ruby’ which is a large spinel from the Plantagenet Kings and the ‘Stuart Sapphire’ from the Stuart dynasty. The monarch wears the Imperial State Crown once a year for the opening of Parliament.